Sometimes vanity rules . . . Check out this excellent article in the NY Times about self-pubbing. On the lighter side of memoirs, this little treat really stuck out. To be honest, I was anticipating its dismissal, assuming it was really about some guy's family and would likely have no impact or interest on the reading public beyond the author's immediate family and friends. It was exactly that which made the book so endearing. Carl Cusato, now a successful consultant, tells the story of growing up in an Italian American family in the fifties and, through the years, overcoming life's little obstacles. Characters make appearances with (nick)names like Big Buck Tooth and Ignorant Louie, and you get a genuine flavor for what growing up Italian was in the fifties (and thereafter). 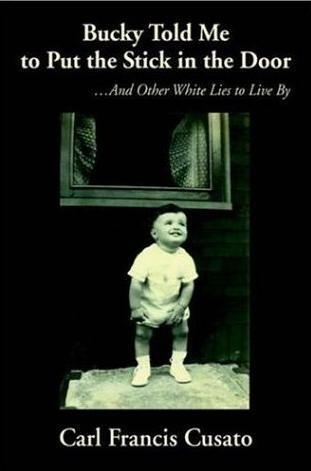 The most compelling parts of the novel are his youngest years, where he describes an upbringing (simple, joyful, funny) that not only has all but disappeared from the American landscape, but the folks who have the tales to tell are disappearing as well. This history is about to vanish forever. And even when the times were not that innocent, they practically defined innocence by today's standards. This memoir probably really was designed to educate/impress/serve Cusato's family, but don't let that push this one aside. It turns out having a grounded family (unlike, say, Augusten Burroughs) is far more interesting than the dysfunctional ones. The book is broken down into 40 easy to read chapters (including an epilogue which the author admits "everyone hates"-- including me) making it easy to read in snippets. Priced at $21.95 on Amazon (no doubt do to the inclusion of images) it's a great book for snowy days.